WRU chief executive Martyn Phillips apologised personally to the Wales squad in their dressing room for the disruption Project Reset caused. It has been confirmed by the Professional Rugby Board (PRB) that there will be no merger of Welsh rugby regions next season and Phillips says the WRU are committed to retaining four regions. The announcement comes two weeks after a proposed merger of Ospreys and Scarlets collapsed and in the aftermath of Wales winning the 2019 Six Nations Grand Slam. Phillips also revealed talks are planned with Wales coaches Rob Howley, Shaun Edwards and Robin McBryde over their uncertain futures. Phillips admitted news of a potential merger between the Ospreys and Scarlets came out at the wrong time in terms of aiding Wales' Six Nations preparations. "I did apologise to a number of the senior players," he explained. "I spoke to a number of senior players in the changing room after the Scottish game and apologised to them because I take responsibility for that, as do the other people in the PRB. "If there's any good to come out of it, they (players) clearly had to dig deep and perform with a pretty major distraction and they came through that. "I would rather the wobble hadn't happened before the Scotland game but, if anything, it brought them tighter. You could see them saying: 'We are going to have to stick together here'. "Hopefully, there will be slightly calmer waters at the World Cup and they will know, when they have to dig deep, that they can and we should all feel proud of that." Phillips says he has already started talking with defence coach Shaun Edwards about his future. Incoming Wales coach Wayne Pivac has confirmed that Edwards will not be retained, but Edwards has distanced himself from taking over Rugby League side Wigan Warriors. "I read the comments in the media, Shaun has been honest and open," Phillips said. "Our agreement with Wayne (Pivac) is to select his own team, it is never about the individual it is about the blend, the blend our coaching team have now is approaching telepathy. "Shaun and Wayne had a conversation, Shaun said at the time he had a chance of a job at Wigan... our understanding at the time was that he signed with Wigan. "On Monday at the Senedd (during Wales' Grand Slam celebration) I told Shaun we would love to have a conversation about his future. "He's gone on holiday, but we will pick it up when he returns. "Wayne will pick his staff, but if Shaun is open to other things, that is a conversation we would like to have. "We talk to all of the coaching team, all of the time... and will continue to do that. "Are they future regional coaches? I wouldn't like to get into specifics, the key for us and for them is getting them into the right next role." A statement said the PRB was "united in its pursuit of what is best" but did not outline plans beyond next season. However, it stated that the PRB "will not be deterred from the pursuit of a solution to ensure the long-term sustainability of the professional game in Wales" and was committed to a four-region model. The PRB - made up of representatives of the four regions and the Welsh Rugby Union - met this week with Rob Davies attending for the Ospreys. 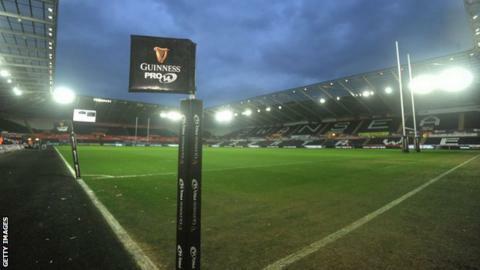 Scarlets-Ospreys merger "off the table"
Davies took over as chairman of the Swansea-based region following the resignation of Mike James in protest at a proposed reorganisation which would have seen a merger with the Scarlets and a new region set up in north Wales. That deal was "taken off the table" on 6 March. Also at this week's meeting were Alun Jones (Blues), David Buttress (Dragons), Nigel Short (Scarlets), Martyn Phillips and Steve Phillips of the Welsh Rugby Union and independent chairman David Lovett. The PRB would, said the statement, aim to ensure the four Welsh regions and the national team are all successful and cleared the way for regions to agree contracts with players. Phillips added that he has been pleased to see five Wales squad members sign contracts in the past week. A new financial deal - the Professional Rugby Agreement - which came into effect on 31 January had doubled WRU funding from £10m to £20m a year, with the funds mostly going towards player salaries. The reorganisation of the game in Wales - dubbed Project Reset - is aimed to tackle the difficulty Welsh domestic rugby has encountered competing with rich clubs in England and France. No Welsh region has ever won the European Champions Cup, while a number of high-profile players have been lured to play club rugby in England and France. The national team's success - having just won a third Six Nations Grand Slam in 11 years and currently ranked number two in the world - is in stark contrast with the domestic game where Scarlets' 2017 Pro12 title is the only Welsh success in the last six seasons.